On a building or remodeling job site, scheduling, budgeting, and more are the responsibilities of the general contractor. A general contractor or GC is hired to take a set of plans and turn them into a building. He’ll orchestrate the comings and goings of the workers, order mate­rials, inspect the work done, coordinate an ever-changing schedule, and handle a lot of the paperwork, which will include material bills, payroll, and issuing invoices to you, the homeowner. The GC will also arrange for the subcontractors—the excavation contractors, plumbers, electricians, dry-wallers, tilers, roofers, and foundation crew, whatever and whoever is needed. It is the GC’s responsibility to make sure the subs do their jobs on time and in strict accordance with the plans. As with an architect, you sign a contract with the general contractor that obligates you to make certain payments at specified points during construction. In return, the GC assumes responsibility for the entire building process. The GC makes a profit by marking up the labor and materials costs by a percentage. That percent­age varies considerably. The typical range is 10 to 30 percent. Many GCs began their careers in the building business as carpenters but at some point decided they wanted to run their own companies and assumed overall management responsibility. In a large construction firm, the GC is actually a company rather than an individual, and an individual project manager will assume day-to-day responsibility for a given job. The project manager may or may not have hands-on building experience but does have business training. Increasingly, the tools of the GC’s trade consist of a notebook computer and a cell phone rather than a hammer and a circular saw. The carpenter-builder GC probably has only one or two jobs going at a time, while a construction company will need more and larger jobs to pay its overhead. The carpenter-builder may have a desk at home that functions as an office and a workshop in a converted garage or basement. The construction company will have an office with an accountant, payroll clerk, and other staff; trucks and miscellaneous vehicles; a warehouse or other building that functions as the base of operations with equipment, materials storage, and workshop equipment, and a variety of other accouterments of a good-size business. The large and small general contractors each have certain advantages. You may be able to shape a more flexible working relationship with the carpenter-builder than with a larger company. On the other hand, the construction company probably has a much greater capacity and can do a broader range of work. If your project is large, you may benefit from the larger crews of a construction company. Logic might suggest that the smaller contractor will be able to give you the best price, but despite the extra overhead costs at the larger concern, there are also some economies of scale. In general, though, the odds are that as a small, one-time buyer of construction services, you’ll do better with a carpenter-builder for your remodeling. He is accustomed to dealing with individual owners, may have more time and patience for your special concerns, and he may well price the job a little cheaper, too. If you’re in doubt, get both companies and carpenter-builders to bid on your job. When hiring a smaller general contractor, determine how much experience the head man has. If the candidate you’re thinking of hiring is a carpenter who’s just branching out and trying his hand at being a carpenter-contractor, think carefully before making the hiring decision. He may master his profession quickly, but the truth is it’s actually a new line of work, one that requires fewer building skills and more business sense. If your remodeling job is modest in scope, hiring a rookie GC may work to your advantage, since many people starting out on a new career have a pride in accomplishment that fades over time. Make sure you are confident he has the scheduling, budgeting, and other skills to handle the expanded duties. Subcontractors get their name from their relationship to the general contractor. When you hire a GC, he will contract with individual subcon­tractors to complete specified tasks for specified prices. You may need several subcontractors or none, depending upon the nature of your remodeling job. Among the subs that may be needed for a residential project that involves extending an existing foundation are a surveyor, earth-moving sub­contractor for excavation and site preparation, and foundation contractor for the footings and cellar walls (though another sub, a mason, may be hired to build the walls if they are to be of block). 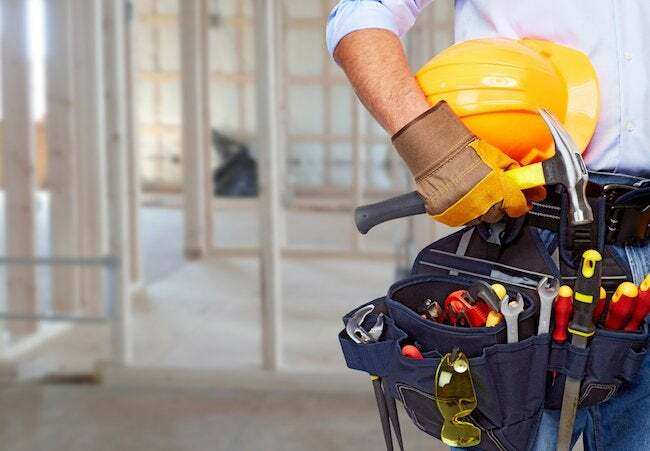 Electrical, plumbing, and HVAC (heating, ventilation, and air-conditioning) subcontractors may be necessary and, depending upon who your GC or carpenter is, roofing, drywall, painting, and clean-up contractors may also work on your job. Usually any vinyl flooring, tile, and countertop needs can be filled by one contractor, while another will sell and install your carpeting. If there is land­scaping to be done, you may need one or even several additional subs to plant trees, lay walks or patios, build walls, seed the lawn, and so on. Depending on local and state requirements, at least the electrician, plumber, and surveyor will be required to be licensed. Electrical, plumbing, and other inspections should be the responsibility of the appropriate subs. If you have a general contractor handling your job, he’ll be in charge of hiring, scheduling, paying, and supervising the subs. If you are your own GC, you’ll be hir­ing them yourself.